Spring 2016 Issue on Stands Now! With the holidays over and Valentine’s Day around the corner, it’s the season to get engaged! 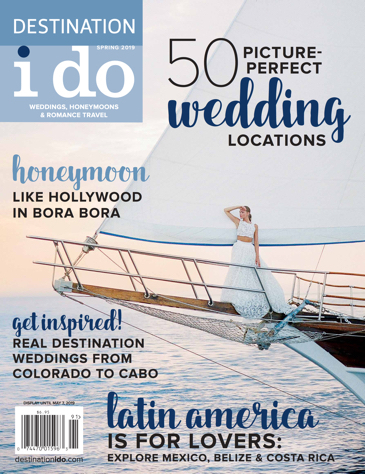 To help the recently betrothed, the Spring 2016 issue of Destination I Do hits newsstands today! While many Americans have been dealing with record-breaking snow the past few weeks, we’ve been looking forward to spring. If you’re ready to say, “I do” and need a romantic, warm-weather light at the end of the tunnel, then our new issue might be the remedy. Our Spring 2016 cover features a shot from our Fashion Forward photo shoot, “Mexico: Old World Elegance.” This feast for the senses was inspired by Mexico’s magnificence and natural beauty. Our bride is beautiful in “The Magnolia Tree” gown by Lela Rose and our groom is wedding-ready in a suit courtesy of Friar Tux Shop. Her hair and makeup were done by The Troublefield Lifestyle and her bouquet was created by Elena Damy. All of this was captured by the talented Sarah Kate Photography on location at Rancho Pescadero resort and the creative direction was executed by Stefanie Miles Events. 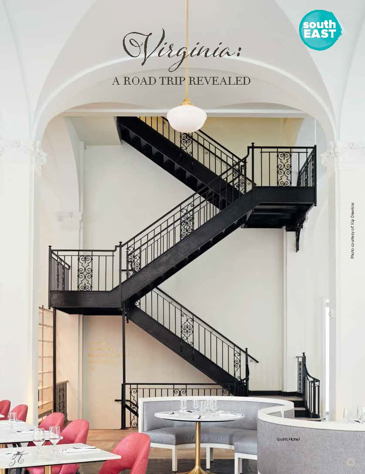 For a behind the scenes look at our cover photo shoot and a complete list of the talented vendors involved, click here. 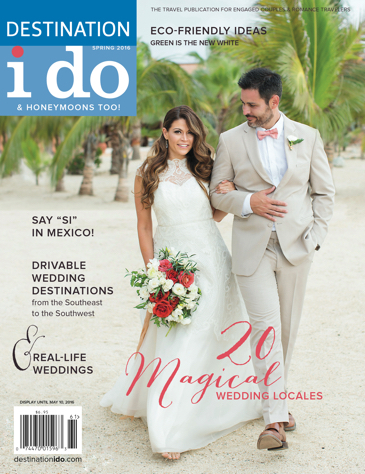 As one of the most popular destinations for weddings away, we’re sure you can find at least one lovely take-away from this Mexico Fashion Forward feature. As always, we’ve scoured the globe for the latest and greatest destinations in which to celebrate one of the most important days of your life. Discover places to say “I do” via our Drivable Destinations and Elevation Enchantment sections including domestic destinations such as North Carolina, Montana, California and the Florida Keys. 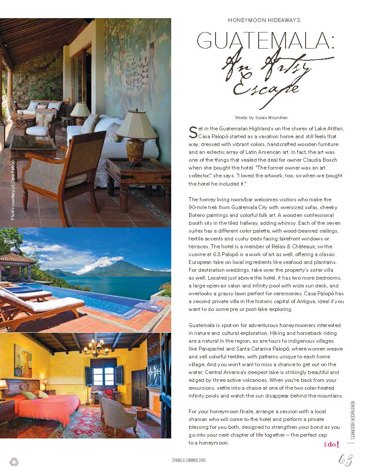 Our Honeymoon Hideaways section is enticing as ever with features about St. Barths, Guatemala and Italy. If you’re looking for fashion and wedding inspiration beyond the beaches of Mexico, we also have two beautiful Fashion Forward photo shoots that highlight sunset hues in California and nature’s natural beauty in Yellowstone National Park. Once you’ve decided on your dream destination, it’s time to start planning the big day and, of course, the honeymoon. Our resident honeymoon expert, The Honeymoonist, explores the recently reinvigorated Cabo, Mexico and our Adventures in Etiquette section focuses on wedding guest decorum. For brides considering a bridal shower in addition to their destination wedding, our Guest Book features one of our Real-Life Wedding bride’s destination-inspired hometown bridal soirée. Speaking of Real-Life Weddings, there’s enough gorgeous inspiration to go around with a colorful Baja bash, a glitzy Lake Tahoe affair, Italian scenery in Tuscany, classic romance in Grand Cayman, peachy hues in Maui, a skyline-inspired event in San Miguel de Allende and Kate Spade kitsch in Vail. Of course, this is just a sampling of what you’ll find between the glossy covers of our Spring 2016 issue. To get the whole scoop, be sure to pick up a copy at your local Barnes & Noble, Target, Safeway, some of the U.S.'s major airports and select newsstands. Can't wait? Visit our website to order your issue today and we'll deliver it straight to your doorstep! As always, we at Destination I Do would like to take a moment to thank each and every person who helped to make this new issue what it is! 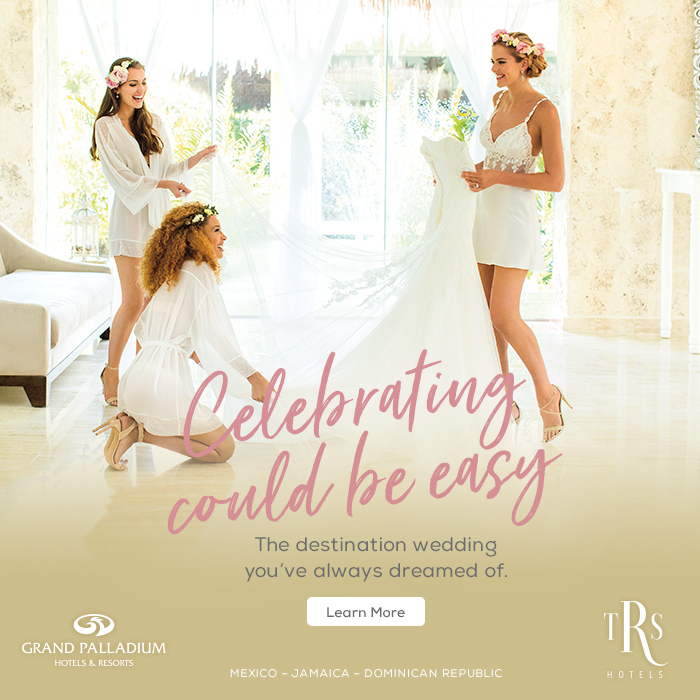 From our real wedding couples, to the talented photographers and creative contributors, thanks for helping us to continue to inspire destination wedding couples and romantic travelers the world over! Cheers to spring and Happy Planning!